What is Bundle Membership and How can I enable it? Bundle Membership as a concept that has been introduced on the platform to facilitate corporate registration. If an admin decides to run a Corporate Membership plan whereby the Corporate becomes the member of the Program and as a benefits to the corporate , it is allowed to add members to the plan. How many members a corporate can add to the program is decided by the Admin. How to enable bundle membership:- In order to enable the Bundle Membership for an existing or a new plan , Click the option to Edit the plan. Once the Edit popup comes up, on the Right side panel of the popup, You will see an option to Enable Bundle Plan. 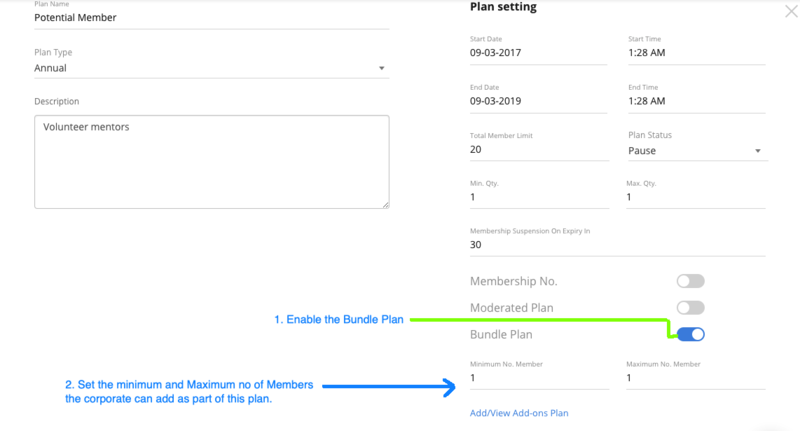 Once the Bundle plan is enabled, please provide the Minimum and Maximum number of Members for this plan and click the save button. This value has no impact on the price of the plan.